This was my first day in the cancer clinic. Dr Kuebler has inserted the needle, and now the technicians take over. A little at a time, my blood is being extracted, spun, and separated. The wanted cells are collected and retained, and then the plasma and most of the blood cells are being returned to me, all via the same (big!) needle. So only one arm is incapacitated for the few hours required. 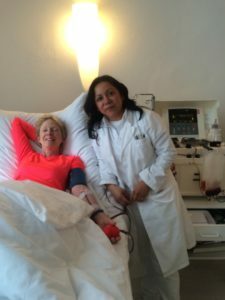 This first collection also provided the blood for apheresis testing, a patented blood analysis for cancer markers which is the foundation of treatment by Dr. Kuebler. This analysis allows the doctor to know how many tumor stem cells are circulating in my blood and how many of my own killer cells are there to keep cancer in check. Thirteen markers are identified and counted in all. The relative aggressiveness and strength of each army of cells determine how many rounds of collection, culture, and reinfusion I will need to have in order to turn the fight to my favor. In other words, by altering the cancer stem cells my own killer cells can begin to recognize and attack them. And by multiplying my trained killer cells my immune system will receive the benefit of reinforcements, both in numbers and in effectiveness. With me in this picture is the technician who is one of the many angels who helped me become an active patient at this clinic. Her name is Jackie. She speaks at least Spanish, German, and English. Jackie rented an apartment for me in her own name so that I could afford to come to Munich immediately, which happened to be at the most expensive time of the year, Oktoberfest. The rent is expensive, to be sure, but it is not as high as a tourist would have to pay at this time. Who knew that Oktoberfest began on September 17?! I arrived on September 18, and this first collection began on Monday morning September 19. No Oktoberfest for me! I need to be right where I am, and I’m so grateful to be here! 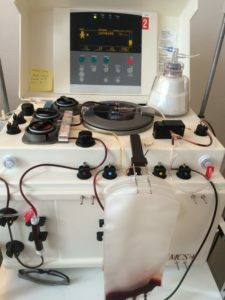 This is a picture of the apheresis collection machine. There is an extra centrifuge sitting on top. The one which is working and doing the spinning of my cells is inside the machine. And that’s my residual blood in the collection bag in the front. The second bag behind it collects the plasma. And here I am when we are through. Nothing but a bandage to show for all that technology. I was very tired the rest of the day, but felt fine. I slept for 12 hours! I did not even have a bruise from that first collection. But the veins do get tired of this abuse. Since then, the bruises are coming every time. My right arm had a very tough first use on its first collection, September 22. That arm was in discomfort the entire time that the needle was in place, and the procedure left my right arm sore and bruised. So in my first week there was quite a contrast between how my body handled the first collection and the second one. That needle is big, and it is difficult to place it within the vein without disturbing the side walls. That’s my story anyway! I’m not ready to say that my right arm is going to have trouble in the future, because I have many more collections to go! But other than wear and tear on my veins and occasional discomfort, the procedure is mild. It causes some understandable syptoms like lightheadedness, and lack of energy. The collections do not make me feel sick. 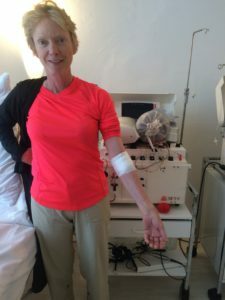 Hopefully, the overall tiring effect on my body will become less evident when I start also receiving my own transfusions. That will begin on October 10, three weeks from the date of this first collection.